Approximately 100 people attended, including the Minister of National Economy Dr. Hasan Abu Libdeh, Minister of Labor Dr. Ahmad Majdalani, and Minister of Telecommunications Dr. Mashhour Abu Daqqa. Abu Hijleh, who has been at the forefront of DAI’s work in Palestine for 14 years, is leaving DAI to become CEO of the Wassel Group, a distribution and logistics services company serving the region. He is succeeded by Waleed Zaru of Ramallah, a longtime project management executive with DAI whose duties now include supervising DAI Palestine projects such as the Facility for New Market Development and Olive Oil Export Development Project II. Mazen Sinokrot, a prominent businessman and former Minister of National Economy, cited the contributions that DAI Palestine and Abu Hijleh made towards economic development in Palestine, including the introduction and development of economic policies, draft laws, and legislation, and the support of Palestine investment conferences. Abu Libdeh also described how DAI Palestine overcame impediments to economic development and facilitated public-private partnership and negotiation. 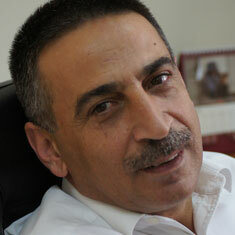 Founded in 1970, employee-owned DAI first worked in Palestine in 1987 on a multinational irrigation support project. It has since performed nearly 40 long- and short-term projects in the territories in sectors such as government accountability and transparency, water resource management, and information and communication technology. Other guests at the event, held at the Movenpick Hotel in downtown Ramallah, included Jamal Al-Jabiri, the Managing Director of DAI Jordan, as well as DAI Palestine staff and alumni, clients, and local business and government representatives.